A beautiful three bedroom house for rent a Kololi with a well maintain Garden, One block off the bertil harding high way Kololi. It comprises of sitting room, dining room, kitchen, guest toilet and en-suite bedroom. A stairs case leading to an en-suite master bedroom and another en-suite bedroom, and a study room. 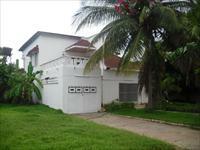 Its have a garage, savant quarters with toilet and shower, mature trees, mangoes, peas, etc.